1 & 2 ounce Bottle Dropper (20-400). This dropper fits our 1/2 ounce glass bottles. 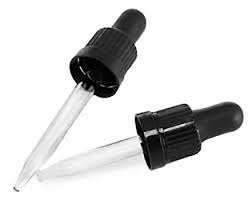 We also carry the dropper that fits our 1/2 ounce and 4 ounce glass bottles. Bottle Dropper Fits our 1 ounce & 2 ounce glass bottle Cap Size 20-400 Length 2-11/16"
The size I needed for a project. Fast shipping and I absolutely loved the sweet treats and wax in the inside. I love surprise gifts! These arrived quickly and were just what I was looking for.